As this issue of the Journal reaches you, votes are coming in for the RSA 2011 elections. Biographical information and photos of all candidates were mailed to you a few weeks ago. If you have not voted yet, get your ballots returned as quickly as possible to John Gyde, RSA Elections Chairman, P. O. Box 801, Creswell, OR 97426, so that your vote can be counted. by the first of the year. Renewal dues are $40 for USA members and $70oo payable in USA dollars for foreign members. If we do not receive your 2011 dues on time, there is a surcharge of $5oo to cover postage costs of shipping your first quarter Journal by Priority Mail. So for late renewals, dues are $45oo for USA members and $75oo (payable in USA dollars) for foreign members. Checks for renewal dues should be made out to Remington Society of America, or just RSA, and be mailed to Robert Kneppler, RSA Treasurer, 718 Westcott Street, Hous- ton, TX 77007-5071. If you have not remitted your renewal dues yet, do so now while you are thinking of it so that you can continue to enjoy the benefits of RSA membership and keep your Journals being delivered as they are issued. Elsewhere in this issue you will find a write-up on the 2010 annual RSA Seminar which was held in Tucson in late September. It was one of the best attended seminars yet and everyone who participated had a great time. If you have not attended a RSA seminar before, you are missing one of the best benefits of being a RSA member. 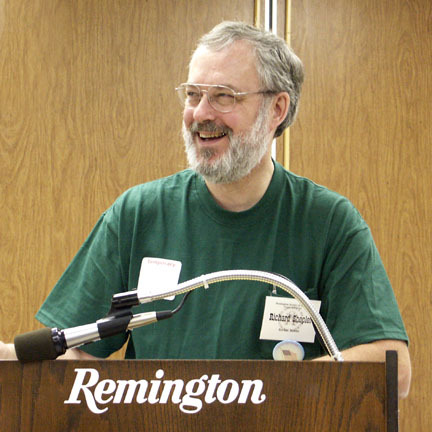 Location and dates for the 2011 seminar will be announced at the RSA Annual Members Meeting in January and published in the first quarter 2011 Remington Collector’s Journal. considered for displaying part of your collection at the Remington Arms Company museum in Ilion NY, contact RSA Director Gene Myszkowski. Corey and Gene’s contact information can be found on pages 2 and 3 of every Journal. Consider writing an article for the Journal. You might not think you have adequate information for a good article but don’t sell yourself short. Contact Journal Editor Roy Marcot for details and help. the more you put into the organization, the more you will get out of it! I hope that you and your family have good and peaceful holiday and wish you the best of everything in the New Year. If you have a family member or friend in the armed forces, please convey our thanks and special best wishes at this time of the year.